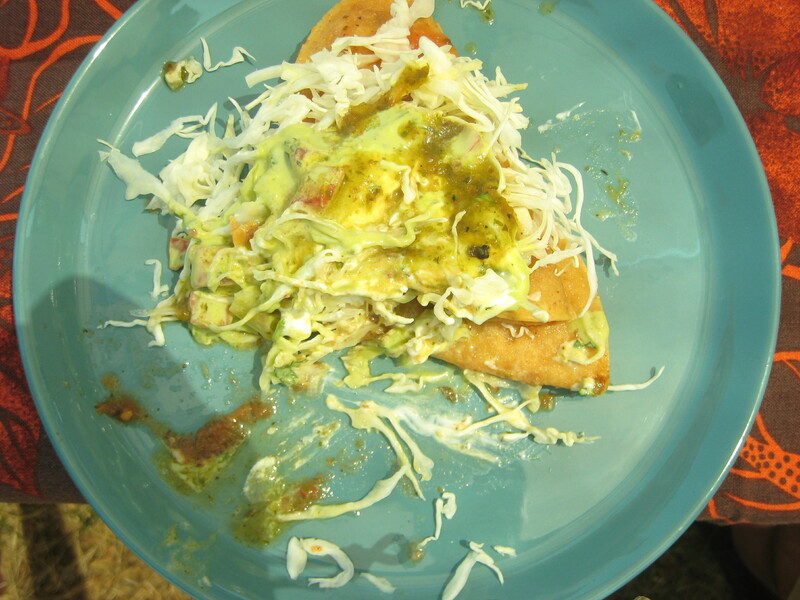 I’ve dated a couple of vegetarians in my day, and they were the first ones I ever saw order tacos de papa. The first time I tasted them, I thought “They’re ok.” I was never into the tacos with the hardened / fried shell. My mom loves tacos with hardened / fried shells, but she never made tacos de papa. I began eating them at the monthly Caracol Marketplace. These are very good tacos de papa. They got shredded cabbage, homemade guacamole, some cheese, sour cream and of course fried tortilla and papa. This weekend we stopped by for breakfast and my picky eater of a daughter loved them! So I decided I need to learn how to make my own. Here is what I came up with. 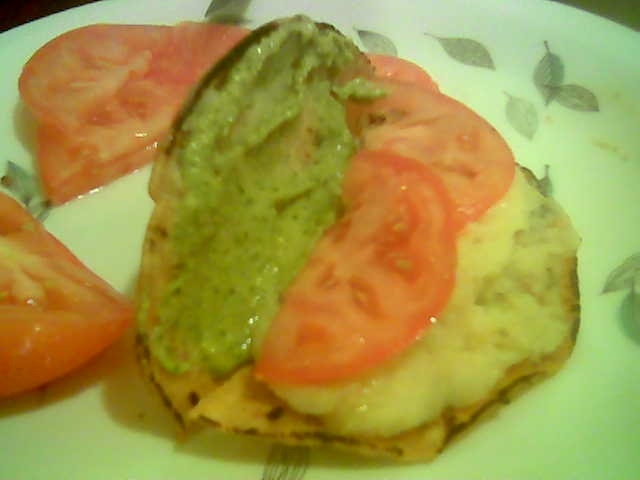 It has cilantro-jalape~o hummus, fresh sliced tomato, Tapatio sauce and of course fried tortilla and papas. It’s a gentrified taco de papa since everything except the Tapatio sauce is from Trader Joe’s. I hope she likes them. This entry was posted in East Los, Eastside, Food, Pendejadas by Pachuco 3000. Bookmark the permalink. The tacos sound pretty good too! love how you added the touch of Tapatio, I put that on everything i got a bottle stashed in my desk at work and it always comes in handy! Tacos de papa, tacos dorados, no matter the name, they are awesome. My favorite is to put crema on the papa, then salsa roja, followed by some lechuga and jamón, topped off with more crema and salsa roja. Sheer deliciousness! my family makes papa enchiladas. my grandma was frustrated when i said at 15 i was no longer eating meat. “well, mija, what are you going to eat?” asked my throughougly confounded abuelita. she started making these EVERY time i went to visit her in the san antone. then came the papas breakfast tacos. i will have to try making these this weekend. i haven’t tried the TJ’s cilantro/jala hummus either, but it sounds like good stuff. AJO! That’s the secret ingredient to the mashed papa mix–yum! We should have a potato-taco cook off. My friend (a Chicano who is a high end French chef on the westside)—gets irritated when he starts a new menu and the owner wants the white-American burrito on it—they call it ‘a wrap’. He hates that. My grandmother used to make us pocho-kids a wienie deep fried in a corn tortilla, topped with cheese & pico pica. You know you had one too! I don’t think I would have liked a hummus/papa taco, Pachuco—it is probably a generational thing. I had an Old Man who made me “Tacos de Chivo” once.